If you’re a Verizon FIOS customer then you are already using the MoCA standard, which is the Multimedia over Coax Alliance. This technology is in use by many cable and satellite providers and supports up to 175Mbps of streamed HD video. 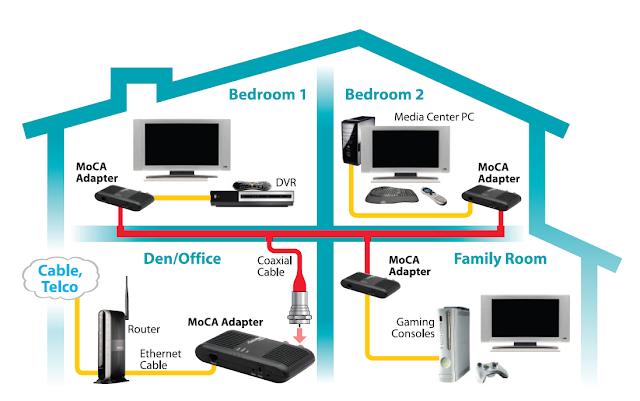 All of the cable set top boxes (STB) in your house connect to your FIOS router through coax cables and stream video content using MoCA which is enabled in the router. As you can see below, each device connecting via MoCA receive an IP address just like another other device on your network. Ok, that’s cool but wifi is ubiquitous these days right, why use MoCA? If you have wifi-enabled devices in your home media stack, awesome, but many TVs, receivers, game consoles and media players are network-capable but not wifi-enabled. If you have a usable coax run in the wall, you can extend your Ethernet to these devices using this technology that is already very much flowing through your household. There are a couple of ways to do this, the first is using a MoCA adapter. If the location you want to extend your network in also has a STB, then you will need to split the signal using a coax 2-way splitter. One output will go to the STB, the other to the adapter. Whatever device you want to connect to your network can do so using CAT5/6 to the Ethernet port in the adapter. Simple. The catch is that these adapters are not cheap at $75 or so apiece and you only get a single Ethernet port per adapter. Of course you could connect a switch behind the adapter if you need more ports. Verizon fully supports this, by the way, and although these adapters are made by Actiontec, there are Verizon branded adapters that you can buy directly from Verizon. There is another method, which is how I do this at my house. Instead of using expensive MoCA adapters, you can use MoCA-capable FIOS routers. There are many benefits to doing this: you get a built-in switch, you can use the router to extend your wifi network if you wish, and they are dirt cheap. The Actiontec MI424WR is the router you want (Rev F or later ideally) and can be found on that giant well-known internet flea market for ~$20. They did a great job over at missingremote.com drawing out what this looks like using MoCA adapters to extend your network. You can use MoCA adapters or routers as I outlined above. The adapter they show here in the Den/Office location is needed only if you go the adapter route, if you use routers, as I recommend, you will only need 1 router per location you want to extend to.